Glycogen: A natural nutritional element found in shell fish. This element gives the shell fish the strength in nature, to remain closed. The positive effect of Glycogen can benefit the LIVER. If you are deficient in Glycogen, you will notice a decrease in energy and a susceptibility to disease. Natural Taurine: This is only found in sea life, such as Oysters, Squid, Octopus and Shrimp. It can have a positive effect on the liver, by detoxifying potentially malignant elements. It also benefits healthy maintenance of blood vessels. Positive benefits can be found in brain nerves as well. The lack of Taurine can increase cholesterol and slow the breakdown of alcohol if it is consumed regularly. Organic Zinc: This is one of over 40 minerals found in Oyster Extract. It is recognized as an important mineral, for maintaining healthy skin condition and reproductive organs. Organic Zinc also increases natural insulin hormones in people with diabetes, as well as increases brain activity, and the negative effects of stress. Substance-Z: (Patented Substance) Substance-Z is the unique quality which makes Oyster Extract stand alone for the most effective and positive benefits available, worldwide. Substance-Z allows all of the healthy properties of Oysters to be condensed and easily digested by users of Oyster Extract. 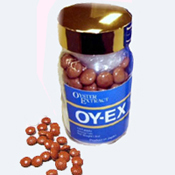 The ultimate result of OY-EX is improved blood circulation and mineral absorption. 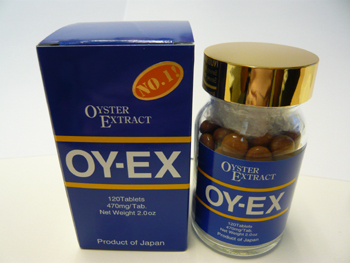 Oyster Extract, 120 tablets packaged in a high quality Medical Glass container. 21 Oyster Extract Tablets (3 tablets per pouch). One week supply for your full review!